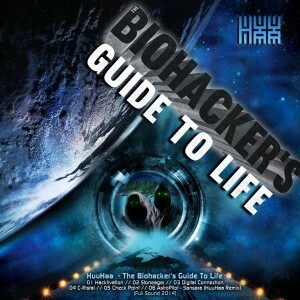 People of the earth: this is HuuHaa official and we have a message, The Biohacker’s Guide To Life. From big bang to black hole, from quark to galaxy, from stone age to digitime, from first fire to rocket science, from caveman to scientist to the digital connection we trust, our cultural and biological evolution are ready for the next big steps. Biohack: find the key and open the sources of the free knowledge base. All that has ever occurred during the evolution is written inside your DNA. Unlock the limitless bio data storage. Start with yourself and the rest of humankind will follow. Quarks, leptons, bosons, photons, protons, neutrons, electrons, atoms, molecules, crystals, stones, distant stars, cosmos is all the was, there is, ever will be, you will see. Biohack yourself to upgrade your body, mind, soul and life. Don’t believe the hype. Use your head, wisely. Question everything, even yourself, even your own thoughts, even your everyday life. There is no room for rumors. It’s time, to get going again: e, te, ate, vate, ivate, tivate, ktivate, activate, it’s time to Hacktivate! MP3 Download | FLAC Download | WAV Download · Download count: 8,075. Sooo chilled, totally hacking!) Good job! 5/5! Thanx for the release! Охуенно понравилось… Чек Пойнт , просто пиздец улетный!! !